Spark R&D Dynafit Adapters allow drill free use of Dynafit Speed Radical toe pieces for the part-time or full-time hardboot rider. Bindingless touring reduces weight for less fatigue and more pow turns. The Spark R&D Ibex Splitboard Crampons are designed for use with Spark's new Tesla and Tesla T1 system bindings. No matter how twisted the hike up looks, you'll be sitting at the top scoping your line in a few. Upgrade from the Voile brackets or set up your new split with the lightweight and friction-less Spark R&D LT Touring Brackets. Comes with shorty bars for compatibility with Mr. Chomps crampons. 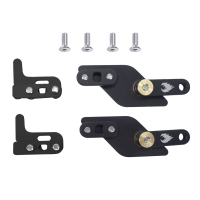 This baseplate kit is for those splitters who already have a set of Spark R&D Blaze or Magneto bindings, but are now ready for the women's Tesla T1 System. Fix your Spark R&D splitboard bindings in the backcountry with this kit. Your knees will thank you for the reduced strain when you splitboard with Spark R&D Canted Binding pucks. Oversize aluminum center discs overlap the binding channels for maximum strength and rigidity.